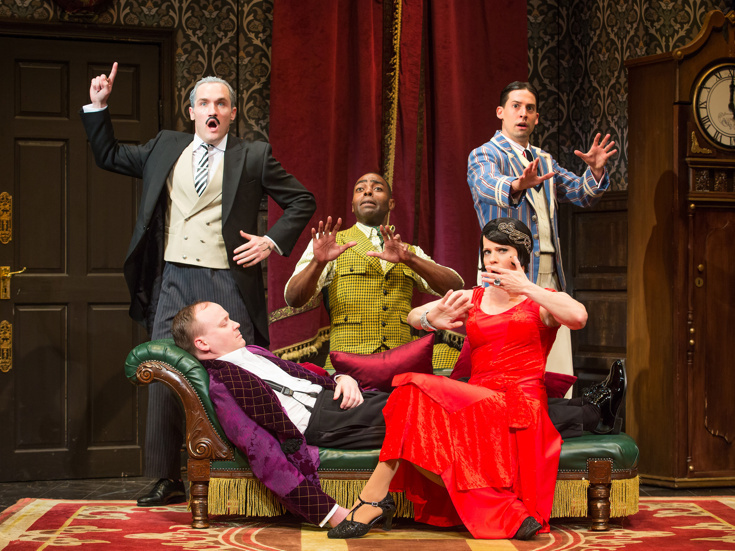 The Play That Goes Wrong is a slapstick farce by Henry Lewis, Jonathan Sayer, and Henry Shields that premiered in London in 2012 and won Best New Comedy at the 2015 Laurence Olivier Awards. It opened on Broadway in April 2017 will close January 6, 2019. You must see it before it closes if you want wild comedic entertainment and a fun night at the theatre. In the play, the fictional Cornley Polytechnic Drama Society attempts to put on a 1920s murder mystery, but the performance is beset with disasters and the accident-prone cast struggles through every scene. The Murder at Haversham Manor attempts to be a 1920s whodunit with everything you never wanted in a Broadway show—a ramshackle set, a leading lady with a concussion, and a corpse that can’t play dead. It’s a classic murder mystery gone beserk with superb actors. You will laugh until you cry during this madcap show…it doesn’t go so well, and the accident-prone thespians fight against all odds to make it through the final bows. The well-timed performances make you feel like you are watching the luckiest Broadway imposters in the world, and you probably are. Which is exactly why the show works. A collection of slaps and smacks, quick witted asides and unexpected misdirection provoke guffaws galore. Everything to do with The Play That Goes Wrong depends on unyielding physical comedy and vert fine comedians who get the audience into laughing by so many worthy and vulnerable efforts. Characters are constantly getting hit by doors, mantelpieces, walls, and other humans. Each time you think they’ve gone down for good, they always get up, trying to calm themselves and carry on as things go more and more wrong. All this fun takes place at the beautiful Lyceum Theatre, 149 W 45th Street, the oldest continually operating theater on Broadway. After the show closes on Broadway it will go on tour.